This was it, the last opportunity for Wizards to salvage pride and keep the Community Team from winning the Cup for the third year in a row. After an incredibly disappointing day with Unified Modern, the Wizards Team was in an incredibly deep 70-point hole. They were going to need to more-or-less perfect the final event in order to even force the draw, let alone win. For the Unified Standard portion of the event, the Wizards Team came equipped with decks designed by R&D member and Latest Developments columnist Tom LaPille. Their deck lists were a fairly standard spread: UWB Stoneforge, Mono-Red, Valakut, Vampires, Tempered Steel, Fauna Shaman/Birthing Pod, Splinter Twin, and Allies. The Community had some similar decks, but also managed to surprise quite a few people with some of their selections. Matching the Wizards decks with Vampires, Splinter Twin, Valakut, Tempered Steel, and Monored, the Community chose to run Puresteel, White-green Poison, and a Blue-black Singleton deck to round things out. 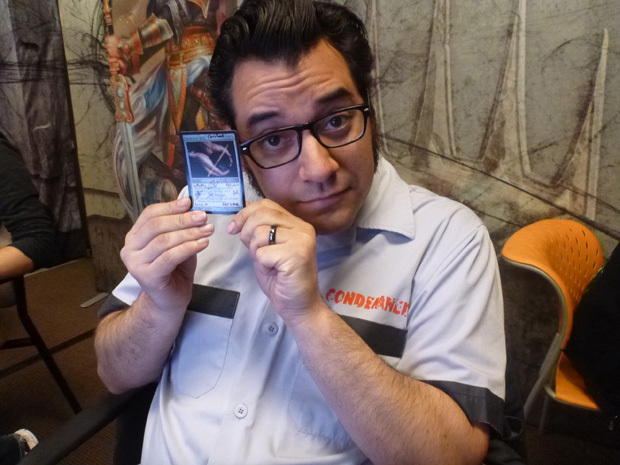 When asked about the singleton deck, LSV could only comment, "The point totals coming into today may or may not have had an impact on my deck choice." With all of the trash talk this week, it was hard to pick out my favorite line. The System Alert put out by Lee Sharpe on Thursday was quite good, Zac Hill ribbing the Community as he bashed skull in Archenemy...there were almost too many gems. And then, as I entered the lobby of the hotel this morning, I finally found my number one. For the Unified Modern, which you may remember the Community dominated, the Wizards crew brought a copy of a paper Darksteel Relic for all of the Community members, saying it was the only thing they'd be winning this weekend. 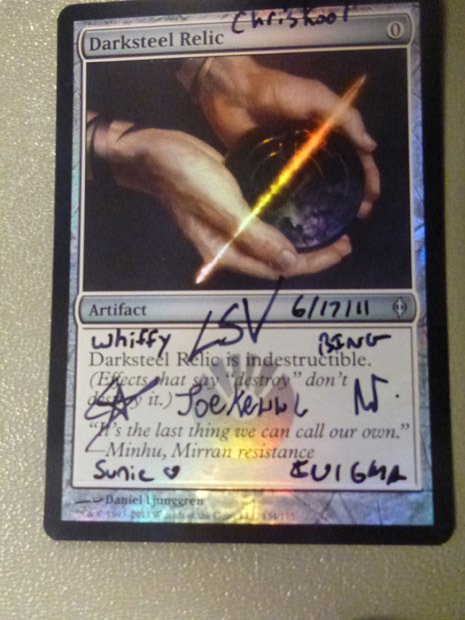 In retaliation, Card Kingdom donated a set of foil Darksteel Relics to the Community Team, who all signed them, and passed them out to the Wizards Team in retaliation for the burn they got the previous day. I thought this was one of the more masterful reversals I'd seen. Let it serve as a reminder: if you can't back it up, don't say it. I'm looking at you Wizards Team! Mike Robles, modeling the newest version of solidified shame. When the first round kicked off things started really poorly for the Community, and it looked like Wizards crawling back might be a possibility. Ethan Schwager and JoeKewwl played a Vampires mirror match that took almost no time at all, with Schwager drawing first blood. Soon after, Mike Robles used his lightning-fast Tempered Steel deck to put Sunie and her Valakut deck out to pasture. Just like that, the Community was down two matches. Just like that, though, the fickle tide turned. Marshall Sutcliffe managed to force a Game 3 against Jon Hickey's Mono-red deck. When Sutcliffe landed his third consecutive Kor Firewalker a few turns into the game, Hickey had to pack it in. Against Kelly Digges and the Birthing Pod deck, LSV drew the single copy of Grave Titan on turn 6 of two of his games, a card Digges had no way to answer. Just like that the Community had evened things up. Things would stay even through the first round, with each team picking up two more wins. While it wasn't the near perfect start that the Wizards Team had hoped for, it was still good enough to keep them in the running. The second round went a little differently. 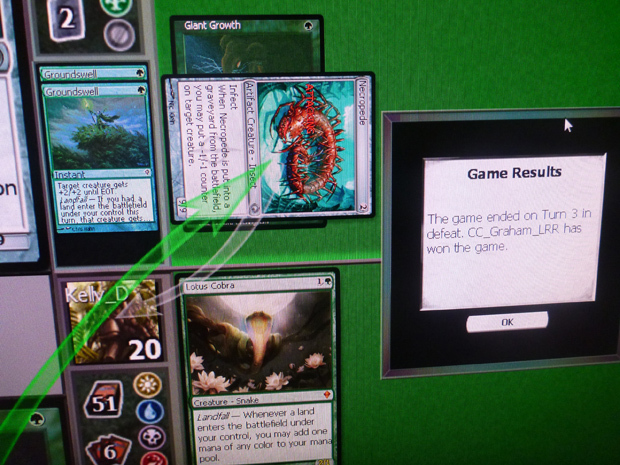 LSV managed to once again best his opponent using his singleton deck by drawing the right cards at the right time. He had a Consume the Meek against Robles's Tempered Steel deck, which completely cleared the board. He also had two copies of Consecrated Sphinx in play (don't worry, one was a Phyrexian Metamorph) when he resolved Jace Beleren. 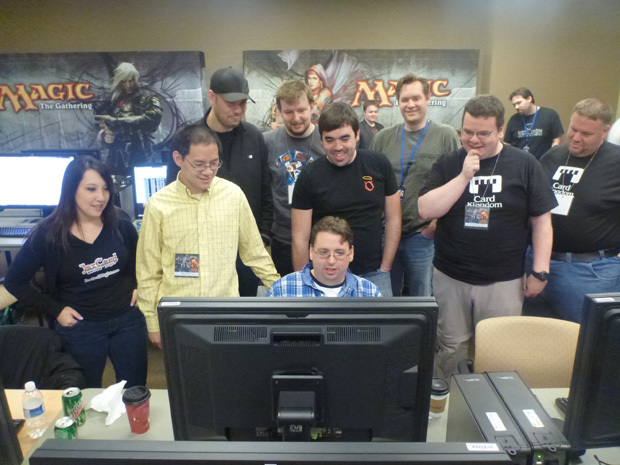 Jace's ability to have each player draw a card turned into five cards for LSV. It should go without saying that he won. Dave Humphreys made quite short work of JoeKewwl with his Splinter Twin deck, while the Community's Splinter Twin player, Bing Luke, lost at the hands of Tom LaPille and his Stoneforge deck despite LaPille clicking through an attack. When you're drawing that many extra cards a turn, everyone wants to watch! But that's where the good news for Wizards ends. Graham Stark got nasty with a third-turn poison kill in one of his games against Kelly Digges. No blocks. Groundswell? Sure. There's no way you have a sec...um...kay...you can't possibly have a thi...OH COME ON! The rest of the Community Team was about as toxic to the Wizards Team. Each other match went the Community's way, giving them a 6-2 finish to the round, resulting in a mathematically eliminated Wizards Team. There was one more round to play, but the Community had won the cup! Despite being eliminated, the Wizards Team still had pride to play for, so they finished out the last round. They managed to get back to where they started: a 4-4 finish. That gave them enough points to say that they had at least gotten more points than the Unified Modern players, who I am sure will be hearing about this for some time to come!